We have been a smidge helpless with fall fashion so we called in the big guns. Candace is a gifted stylist and creative consultant in Birmingham, AL. She is also a good friend so luckily it didn't take too much convincing to get her to show us how to dress ourselves. The temperatures are slowly cascading into the mid-60's, creating cool fall evenings and crisp mornings. One of my favorite things about fall (in addition to the mild temperatures) is the apparel. The clothing always seems to embody the colorful, cozy essence of autumn. This season trends from the runway to the storefront capture the relaxed, bohemian character of the 60's and 70's; a sort of casual, yet refined elegance. I've translated some of my favorite trends into 3 simple looks that you can easily pull together for a polished autumn look. The maxi dress has quickly become a classic staple for the modern woman's closet. 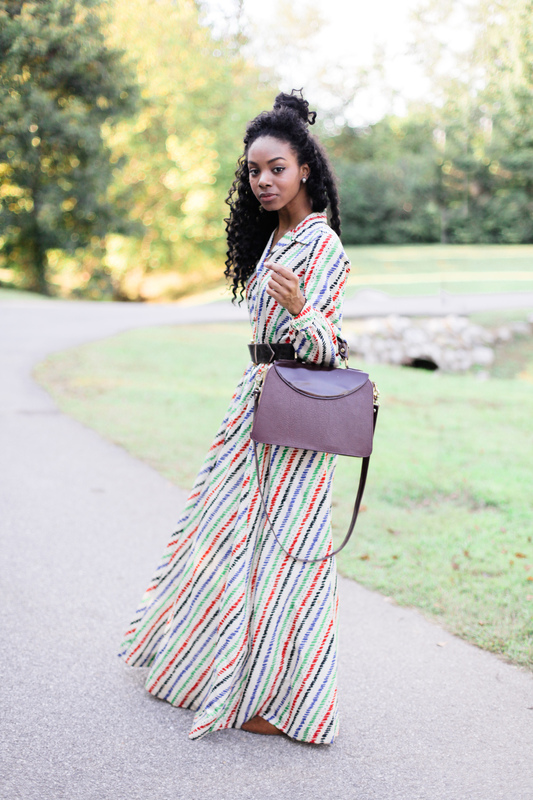 For instant fall elegance and a non-traditional workday look - pair a patterned maxi dress with a leather belt at the waist and a structured handbag. From day to evening, there's not an easier ensemble than a jumpsuit. It's almost equivalent to the "LBD" (little black dress) in my book. This is a great transitional fall piece for work wear or evening. You can pair a simple black jumpsuit with a plaid blazer, suede flats and a leather clutch for easy fall elegance. A beautiful way to incorporate fringe into your fall get-ups is a dress. For an easy weekend look - pair a suede, fringed dress with leather mules and your favorite fall jacket. Pull your hair into a half-up, top knot and voila!